Hey everyone! Hope you are all well! This is my first review since like May! It doesn't feel like that long ago I was sitting down most days working on like 5 reviews at once. It may take me a while to get back into the swing on things properly so I do apologize if this review isn't that great. I am however going to do my best so I hope you enjoy it. Before I start the review though I have moved forward with the plans to redesign my blog and I am happy to say that I am working with Pursuit of Felicity on a brand new blog design. She has designed Niomi Smart's blog design and also every blog design of Kayleigh's aka CoutureGirl. I am extremely excited to be working with her so hopefully at the end of this month FleurDanielle will have a new look and feel. I couldn't be more excited. Before I get too excited let me get back to the point of this post. Back in August I had my 23rd birthday. Now unfortunately because I was in Turkey I wasn't able to celebrate the day with my family and friends. However when I came back home on Sunday my mum had filled a bag with birthday presents for me which I thought was really sweet and totally unexpected. One of the items in that bag was this Made In Chelsea perfume. I absolutely love Made In Chelsea. It annoys me sometimes but it is definitely a guilty pleasure of mine as I'm sure is the same with a lot of other people. I never really watch it around my parents though so I am pretty surprised my mum knows I watch it. When I originally saw the perfume I had pretty high expectations. 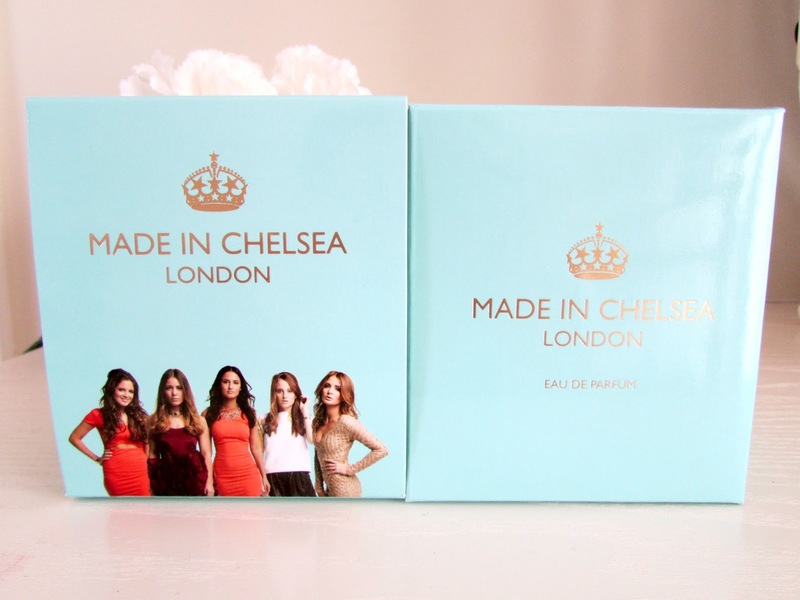 Made In Chelsea revolves around some of Chelsea's richest which meant that I expected the perfume to be very sophisticated. Something that you can wear both during the day and at night. I must say I am not disappointed. The Fragrance Shop has described this perfume as 'Made In Chelsea is a luxury blend of soft florals and juicy fruits with a wooden dry down'. The top notes of the perfume consist of cocktail orange, mojito mint and a dash of lemon. The heart (middle) notes consist of Lily of the valley, rose and a subtle hint of raspberry. The base notes then contain hints of amber, frankincense, sandalwood and musk. The perfume smells very fruity, sweet and girly and the scent really does last for hours. The base notes come through just as the scent is about to fade but even then you can still catch a slight scent of the perfume. For a sophisticated perfume I will admit the packaging isn't quite something that screams 'Chelsea' but it is beautiful nonetheless. The bottle is a transparent turquoise colour which I really love. As well as being my favorite shade of blue I also love the fact you are able to see just how much perfume you have let which is perfect for knowing when you will run out. 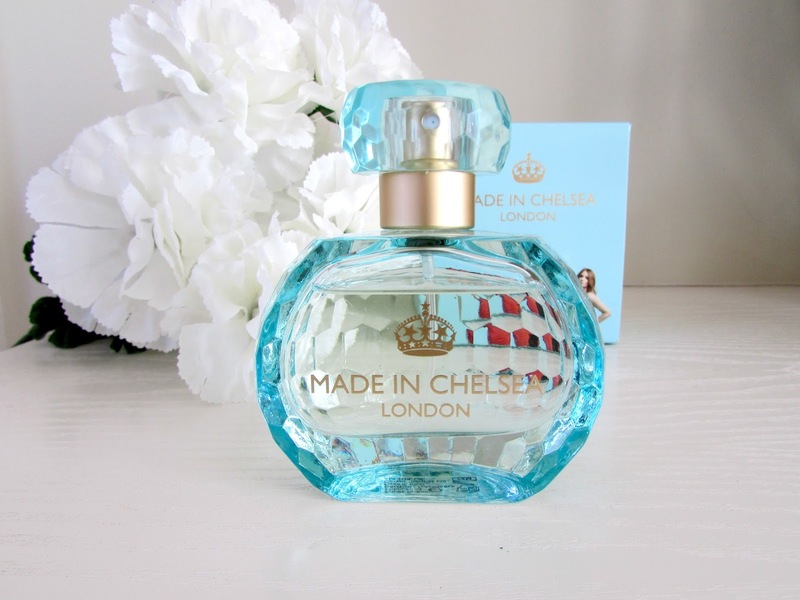 The bottle has the well known Chelsea crown printed on top which is a signature staple for this show in Gold which matches the perfume's nozzle. Overall I am really impressed with this perfume. It is definitely something that I will consider purchasing again in the future. It doesn't scream typical celebrity perfume and isn't sickly sweet and the bottle just looks absolutely gorgeous sitting on my dressing table. If you are interested in this perfume then you can head on over HERE where not only can you purchase the perfume but you can also buy a gift set that also contains a body shimmer. 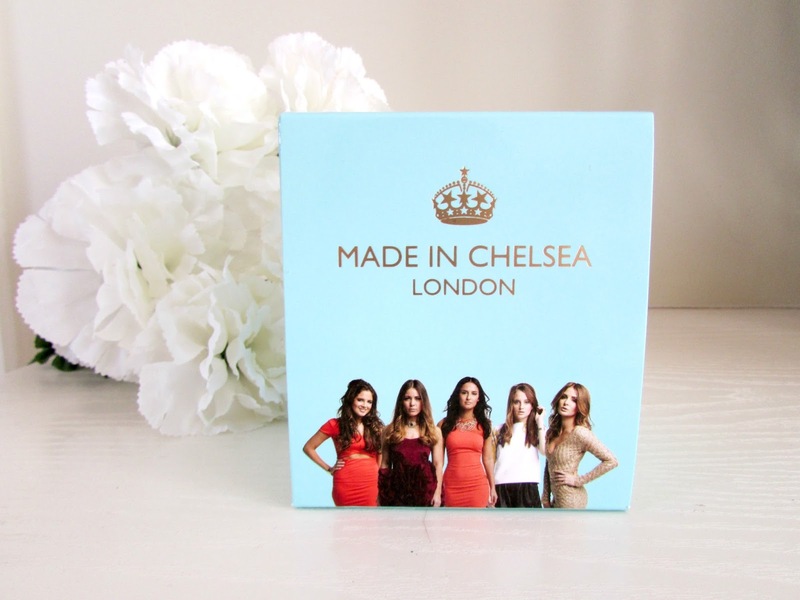 Perfect for all those Made In Chelsea fanatics this Christmas!